Do you ever notice yourself having the same conversation with different people within a short period of time? (And not the boring “Ho, man, the weather, right? !” conversation that should never, ever have to happen between people who like each other.) I realized that in the past week, I’ve talked to three separate people about how easy it is to completely change the course of your life with a seemingly small action, and then not realize until years and years later– in my case, almost a decade– how massive that shift actually was. I’m not sure how specific I can or should get without upsetting a few balances in my life, even though I’m not sure how “balanced” those balances even are right now. But I’m also not sure how cryptically general I can be without making you lovely people hate me for being so freaking cryptically general. I guess I’ll just say that I made a decision to assert my independence at a young age and have only just realized that, in the process, I may have inadvertently completely bleeping jacked up any chance of “following my dreams.” Those last three words are in quotes because part of me– probably the Indian part of me, since I feel like “dreams” are a privilege and brown people laugh at those things– thinks that most people in the world aren’t afforded the opportunity to lament not pursuing dreams, and so I should STFU and be happy with my life. And for the most part, I am. But then…Eh. I dunno. I guess the title of this blog does start with the word “sad,” so, you know, can’t expect Sesame Street, right folks? I’m trying not to complain. Like I’ve said many times before, I am thankful for so much of my life. But sometimes it’s hard not to feel like there’s something I’m not doing that I could be, you dig? So, to start, I’m going to let ya’ll in on a secret: this recipe is a monster hybrid of two other recipes, only one of which you’ll notice I linked to, because the other one sucked so badly. It was so bad that I realized about halfway through preparing the “treat” gave it the side-eye and decided to ultimately Tim Gunn it into this recipe (holla at me if you get the reference). Cool? Cool. 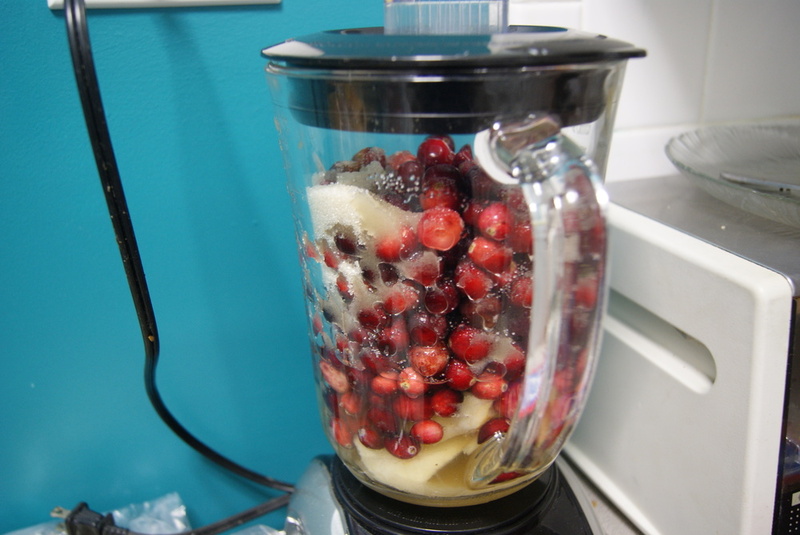 Start by pureeing the one chopped pear together with your cranberries, 1 cup of sugar and 1 cup of water in a blender. 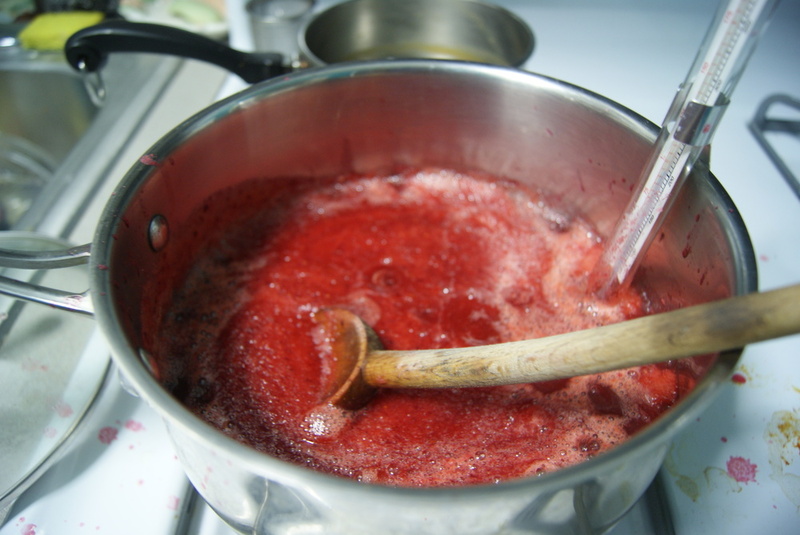 Mix until smooth, then transfer puree into a medium-sized saucepan and cook over medium heat for 8 to 10 minutes, stirring occasionally (be careful, as this will most certainly splatter, neat freaks), until thick. Transfer to a medium-sized bowl and set out to cool at room temperature, about 2 hours. When puree is cooled, add in your remaining chopped pears, flour, cinnamon and salt, and toss to combine. Set aside. 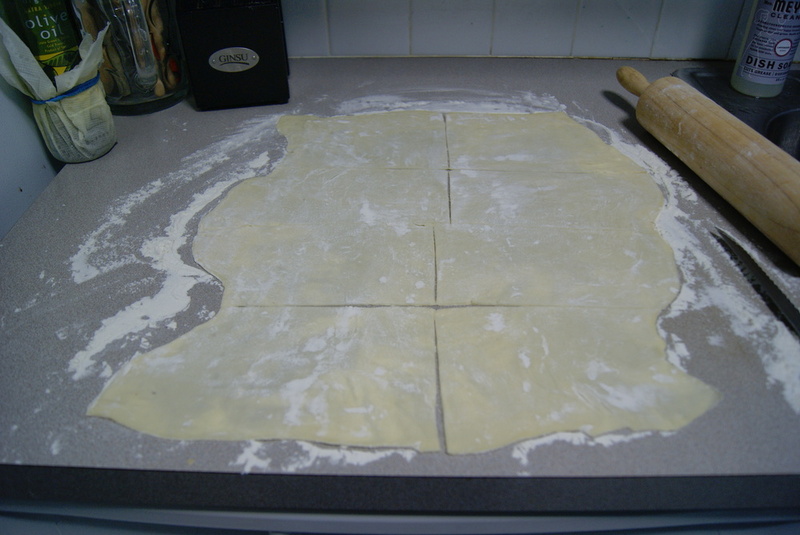 On a lightly floured surface, roll out the puff pastry to a 12 to 14 inch square. Note that you don’t have to be exact about it. I sure as hell wasn’t. Divide the square into eight sort of equal smaller squares. 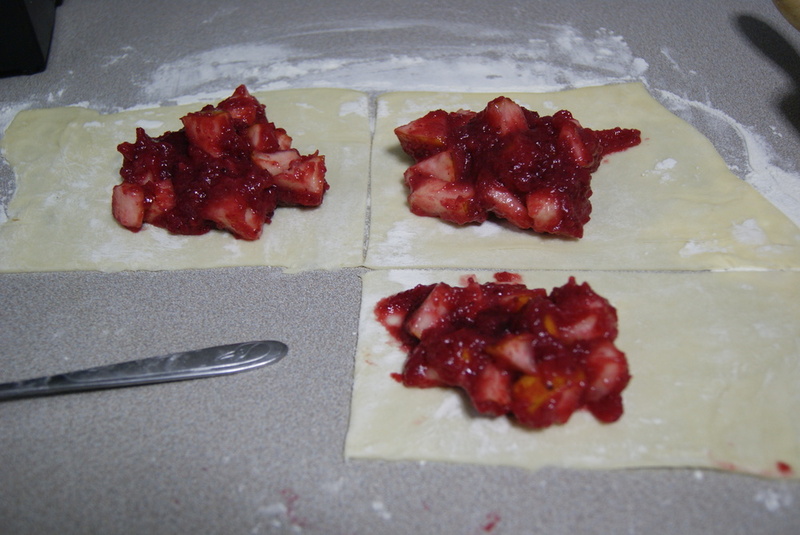 Spoon some of the pear mixture onto one side of the pastry, then fold over and crimp the edges. You’ll notice that I said “some of the mixture” and did not give you an exact amount. Try less than what I did, but more than a teaspoon. Basically just make sure you can close them properly. I mean, I could, but it took some maneuvering and a LOT of annoying questions about the elasticity of puff pastry dough from my boyfriend. Still, I ain’t complaining about oozing, hot, gloriously gooey hand pies. Preheat your oven to 400ºF, and brush each pie with a bit of egg white. Sprinkle sugar on top, if desired, then send these babies into the oven for 30 minutes, until they are golden and the fruit mixture looks bubbly. Ok, originally the plan was to haul these over to my parents’ house as part of our Thanksgiving dessert menu but…um… I was having a lot of feelings that night and decided to eat them. The pies. Also my feelings. I definitely ate a lot of feelings that night. And the feelings tasted PHENOMENAL. 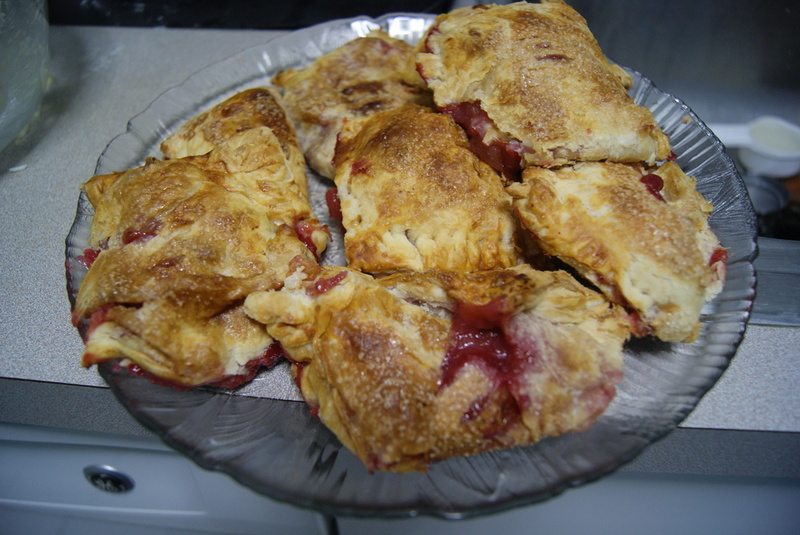 They’re flaky, gooey, tangy and overall wonderful. They’re also not too sweet, which I greatly appreciated. Also! Without getting all preachy on all of you, I’m trying to put together a toy drive for homeless kids, working with Coalition for the Homeless. Here’s a link to the wish list based on a list provided by the Coalition. If you’re willing and able, or know someone who is, please contribute. Thanks friends!